Waimea District Park | | Nan, Inc. 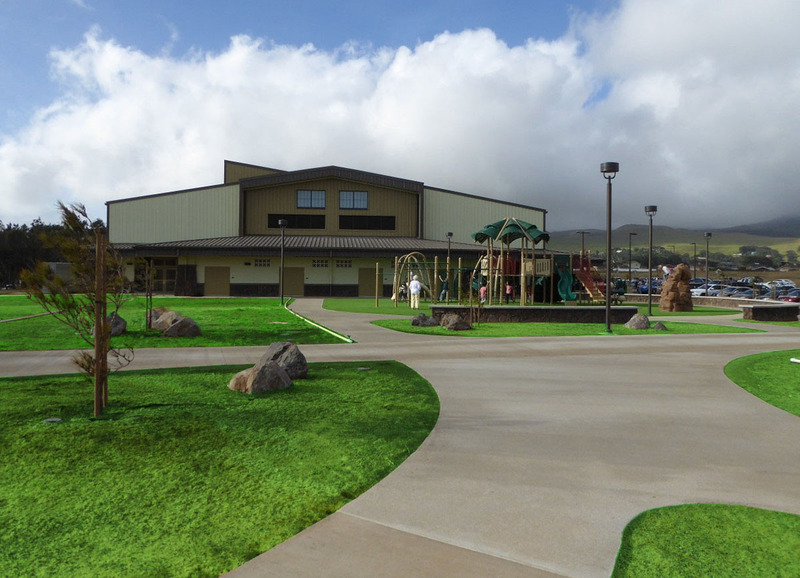 The new Waimea District Park is a 25 acre site that includes a covered play court, a children’s playground and a sports field with ample parking for each activity. The covered play court contains three separate courts with each court capable of hosting either basketball, volleyball or tennis matches. There are interior bleachers and scoreboards for each court and automatic dividers between them. The structure also contains an office, concession area, many storerooms and restrooms. The children’s playground is adjacent to the covered play court and designed with low wall seating allowing the parents to monitor their children. Both soccer and football can be played on the sports field where the spectators can watch from either terraced seating or the grandstand. The field is equipped with football goal posts, soccer goals and field lighting which will allow for night games. Another future sports field and a future baseball field was also mass graded within the park site. The entire site is surrounded by a perimeter fence due to Parker Ranch actively ranching the adjacent property. Pedestrian walkways run from entrance at Ala Ohia Street and throughout the site. The site is lighted at night by a series of roadway, parking and walkway lights. The project was bid on 05/21/15. Due to all the bids being over budget, the project scope was modified and awarded to Nan, Inc. on 09/14/15. The Notice to Proceed was issued for 11/10/15 and the Final Inspection was conducted on 11/28/16. The site blessing with Mayor Billy Kenoi , County Council members, Parker Ranch CEO and the Waimea Community was also held on 11/28/16. Besides the tight schedule, there were a few other challenges during construction. The constant wind and rain notorious in the town of Waimea made erecting the covered playcourt very difficult. In addition, the onsite material used in the mass embankment had a high content of ash, a fine powdery type of material. The use of water in the embanking procedure had to be carefully monitored to acquire the proper results. Finally, the combination of the wind and the ash made dust control a monumental task.